2019 is the 28th season for the Anchorage Market & Festival in our home at 3rd & E Street in downtown Anchorage. It was first established in 1992 as the Anchorage Downtown Saturday Market, and consisted of about two dozen vendors with an emphasis on fresh Alaska Grown produce. The mission of the market was “To provide a conveniently located family oriented open-air Market for Alaska residents and visitors to shop and enjoy Alaska’s beautiful summer season while creating economic opportunities for local citizens and businesses.” From its beginnings through the 1998 Season the “Saturday Market” was operated by the Anchorage Parking Authority. In 1999, the Anchorage Parking Authority issued a Request for Proposal (RFP) for the management of the Market and this was awarded to its current manager, Webb’s Consulting and Management Services, Inc. of Anchorage. Under the management of Webb’s Consulting the Market grew and flourished into what it is today, one of the largest and most successful open-air weekend Markets of its kind in the United States. As of December 31, 2018 Webb’s Consulting & Management Services, Inc has sold the Anchorage Market to Alaska Markets & Events, Inc. On January 1, 2019 the Anchorage Market is under the ownership and management of Alaska Markets & Events, Inc. Under new ownership Alaska Markets hopes to continue the long standing reputation of the Anchorage Market as a family destination in downtown Anchorage. The Anchorage Market operates eighteen weekends starting in mid-May and ending in mid-September constitute our season so that we provide the Anchorage community and visitors with a summer weekly attraction and family event suitable for the enjoyment of adults and children of all ages without charging for admission. 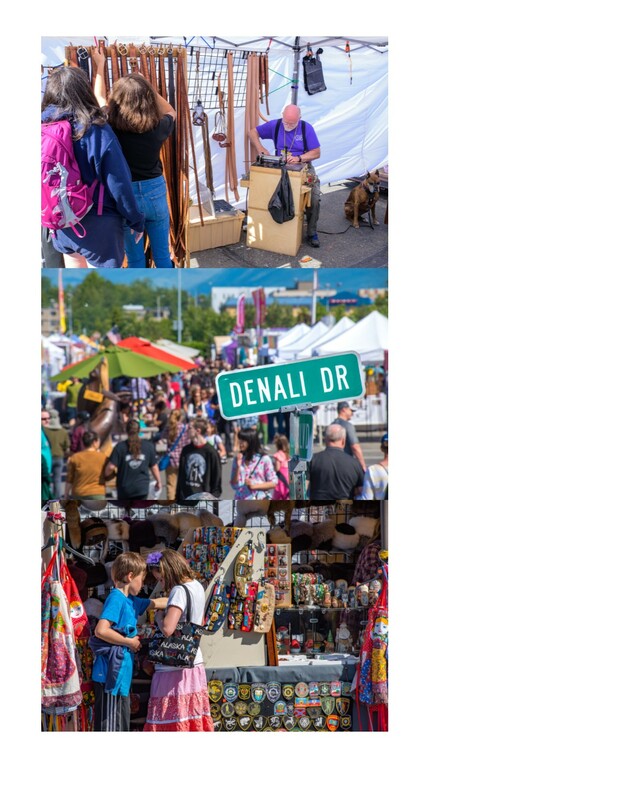 During the 2019 season, more than 300 vendors will fill our booths to offer Alaska’s largest variety of products, including unique handmade arts, crafts and gifts by Alaskan artisans, collectibles, furs, jewelry, fresh produce, a wide variety of foods to eat at the market or take home and so much more! But shopping is only part of the Anchorage Market & Festival’s appeal. Our Main stage provides continual entertainment during operating hours of 10AM to 6PM on Saturdays and 10AM to 5pm on Sundays while buskers (street entertainers) perform in the area by headquarters and in the aisles throughout the market. Our 30 food booths make us Anchorage’s largest restaurant with the most diverse and exciting menu in town. However, food and shopping are 2nd and 3rd on the pollster’s results as the reason to visit Anchorage Market & Festival. People (and dog) watching, along with the general ambiance of the place are way out in 1st place with market-goers. The Anchorage Market & Festival has become a very special event and destination for many locals and visitors, and plays a very important role in our community. Counts by consultants and staff show that more than 600,000 people attended the market last season and more are expected this season, an astonishing 25,000-40,000 visitors per week. Considering Anchorage’s population of about 300,000, this is a truly amazing number!